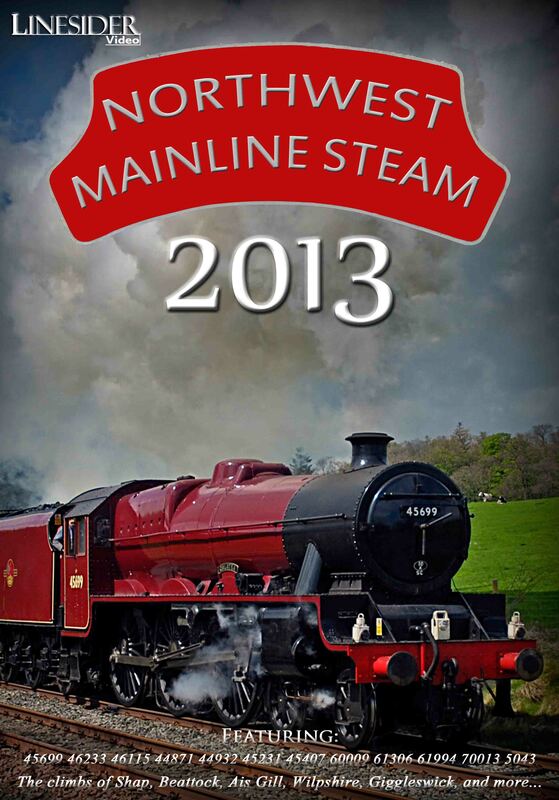 Northwest Mainline Steam 2013 follows on from our 2012 review, featuring a wide variety of motive power over the region’s routes and major climbs, covering the area from Todmorden in the south to Mallaig in the north. All material was shot in High Definition and the DVD includes on-screen details of railtours, locations, dates and gradients. A minimal commentary is timed to avoid conflict with the sounds of the locomotives. 44871 & 45407 double heading the Winter Cumbrian Mountain Express in sun and snow, Tin Bath and Great Britain VI railtours, seen on the climbs of Shap,Beattock, Copy Pit and Sough. 60009 Union Of South Africa Impressive on-board and lineside footage of the A4 over Shap in winter and summer, including 54mph over Grayrigg, 41mph over Shap and 75mph through Penrith. Also seen restarting its train on the 1:100 at Ais Gill following an unexpected stop, and on the Newcastle-Carlisle line in May. 45699 Galatea Extensive footage of the Jubilee’s incredible return, including its test runs, its first railtour, and autumn run hauling 13 carriages in glorious weather from Carnforth to Chester, seen at Capernwray, Borwick, Low Bentham, Clapham, Whalley arches (x2), Pleasington, Hoghton (x2), Wilpshire Summit and Giggleswick Bank (x2) - including incredible scenes of it working into the sunset with the glow from the firebox illuminating the smoke. Finally, both autumn runs over Shap are featured with scenes at Shap Summit, Scout Green, and Shap Wells. 61306 Mayflower on a mainline test run, seen exiting Wilpshire Tunnel and at speed on the WCML. 44932 is seen on an early morning run from Carlisle to Blackpool at Smardale Viaduct and Kirkby Stephen. 45231 The Sherwood Forester The return of the Black 5, seen on a test run and The Fellsman at Birkett, Wilpshire and near Garstang. 46233 Duchess of Sutherland Extensive coverage of its 2-day 75th anniversary railtour over Shap and Beattock, seen near Garstang, Shap Wells (panoramic and lineside), Beattock (x2) and Beattock Summit, Carstairs, near Craigenhill Summit (x2), Crawford (x3), Beattock Summit, Beattock loop, leaving Lockerbie (x2), Plumpton, Kitchenhill, Shap and Lancaster Station. Also seen on Shap and the S&C in May, and high speed double heading with 5043 Earl of Mount Edgcumbe over Shap - unprecedented power and performance as they blitz Grayrigg and Shap at 65-70 mph! Also seen tearing through Lancaster. 44871 at Polnish and on Beasdale Bank, and on-board footage from Mallaig to Fort William, right by the smoke box. 62005 K1 action on the West Highland line at Fort William, Beasdale, Morar and Polnish. 44932 & 45231, and 70013 Oliver Cromwell on special railtours to commemorate 1T57, seen at Lunds, Mallerstang and Ais Gill. 46115 Scots Guardsman The Scot is seen on Fellsman and Cumbrian Mountain Express duties at Oxenholme, Mallerstang, Hoghton, Dent, Brock, Scout Green and Shap Summit. 61994 The Great Marquess Impressive action from the K4 on its epic northbound journey over Shap and Beattock in September. Also featured are shots of it at work on The Fellsman.